Background: Peri conceptual folic acid prevents 70% of neural tube defects. Worldwide and in Australia 30-64% of pregnant women adhere with current peri conceptual folic acid supplementation guidelines and 39-82% is aware of its timing. Objectives: This paper focuses mostly on awareness of peri conceptual folic acid supplementation in pregnancy. Design: Prospective cross-sectional interviewer-assisted survey. Setting: Ipswich Hospital, Ipswich, Queensland, Australia. Participants: 400 pregnant women, ≤20 week’s gestation, attending their “booking in” visit. Results: Full awareness of the importance of folic acid in pregnancy was evident in 70% of women and was significantly associated with its adherence (P<0.05). Full awareness of the peri conceptual timing was evident in 47% of women and was significantly associated with its adherence (P<0.05). Full awareness of both the importance and timing of folic acid was evident in 36.5% of women. Conclusion: Full awareness of peri conceptual folic acid supplementation in pregnancy is low. More work is needed to address this so that women receive specific information regarding the importance of folic acid as well as its peri conceptual timing. Adequate use of peri-conceptual folic acid supplementation (PFS) varies considerably within Australia and worldwide5,6 and may be influenced by many maternal factors, including age, education, smoking and socioeconomic status.5 One strategy to optimise folic acid intake in women of childbearing age involves improving awareness and knowledge concerning the benefits of FA.5 Awareness of FA is strongly associated with its use.7,8 Awareness of folic acid in prevention of NTD varies from 50-73% internationally8−10 and is around 60% in Australia.11 Within Australia in states such as Queensland where there has been no targeted public health campaign on NTD prevention the figure is likely to be much lower. There is a dearth of research on FA awareness, awareness of it in NTD prevention and its specific use amongst pregnant women in Queensland. This study was therefore conducted in an area of Queensland that has a higher socio-economic disadvantaged population compared to the Queensland average.11 This paper will only focus on the awareness of folic acid and of its role in NTD prevention amongst pregnant women attending for antenatal care. This was a prospective cross-sectional survey, over a 7-month period, of women attending for their first booking in visit with the midwife at Ipswich Hospital, Ipswich, Queensland. During the year a total of 1830 women were seen at the antenatal clinic. Women were requested to participate if they spoke good English and were 20 weeks or less pregnant. Clinics were surveyed on each of the five working days of the week with the total of 75 clinic days over the study period. After obtaining informed consent women were interviewed in a private room. A piloted semi-structured interviewer-assisted questionnaire was used. Unprompted, open-ended questions were used throughout to minimise response bias and ensure women’s awareness was comprehensively assessed. Data entry and quantitative data analysis were performed using SPSS Statistics Version 19.0.12Bivariate analysis was performed using Pearson’s chi-squared test. Logistic regression was performed to generate Odds Ratios, 95% Confidence Intervals and P values for all socio-demographic characteristics of respondents. Data from open-ended responses were coded and presented as themes. Over a period of 7 months 410 women were eligible; 8 women declined and 2 were excluded as the gestational age was subsequently noted to have been >20 weeks by ultrasound scan. Demographics data showed that 49.0% had high school or less education, 38.8% were unemployed, 20% had a total household income of < $35000 per annum and 11.8% had private health insurance. Overweight or obesity was present in 59.8% and 31% (124/400) of respondents were still smoking. Women’s awareness of folic acid supplementation (incorporating awareness of importance of folic acid as well as its peri-conceptual timing) was classified as “full awareness” in 36.5% (146/400; 95%CI, 31.8-41.2%) and 87.7% (128/146) of these women were aware of FA prior to pregnancy. “Medium awareness” was present in 24.3% (97/400) and “poor awareness” in 39.3% (157/400) of respondents. 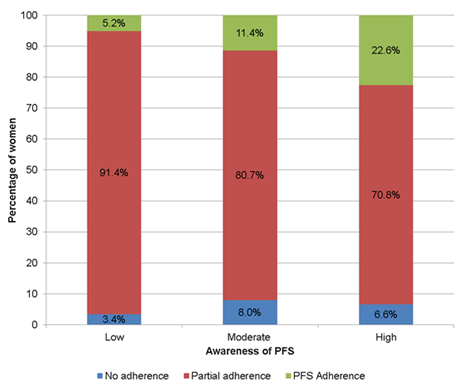 Awareness of PFA was significantly associated with its adherence (P<0.001) with higher awareness increasing adherence (Figure 1). Additionally, awareness of FA prior to pregnancy was significantly associated with use (P=0.024). Figure 1 Relationship between peri conceptual folic acid (PFA) awareness and its adherence. When asked, “Have you heard of folate or folic acid?” 91.3% (365/400) of women responded positively. Having heard of FA was not significantly related to PFS adherence. Of the women who had heard of FA, 81.1% (296/365) had heard of it prior to pregnancy. Having heard of FA prior to pregnancy was significantly associated with PFS adherence (P=0.024). Women who had not heard of folate or FA were excluded from further analysis of awareness. When asked what substance folate or folic acid the various responses are shown in Table 1. Themes that emerged were categorised as high, moderate and low levels of awareness. A high awareness was present in 32.6% (119/365) of women, who identified it as a B vitamin or vitamin. A moderate level of awareness was present in 15.3% (56/365) of respondents, whilst the largest proportion, 52.0% (190/365), had a low level of awareness. The majority of women with a low level of awareness, 23.8% (87/365), responded that they were unsure what folate or FA was. When asked if FA supplements are important for women to take 98.4% (359/365) of women replied affirmatively. These women were asked to explain their reasoning. The themes that emerged from these responses are shown (Table 2). High level awareness of the role of FA in preventing NTD was evident in 70.5% (253/359). High awareness was significantly associated with adequate PFS use (P=0.002). Poor awareness was present in 25.3% (91/359) women - the most common responses were that folic acid was important for growth of the baby 14.5%(52/359) and for pregnancy 7.2% (26/359). The most common incorrect reasons provided for the importance of FA in pregnancy were prevention of Down’s syndrome (17 women), cerebral palsy (6 women), cystic fibrosis (2 women) and to help iron levels (9 women). In response to the question “When should women take FA supplements?” 47.3% (189/365) of women’s responses were adequate as they encompassed the recommended PFS timing, for at least one month prior to conception and for at least the first trimester. Adequate awareness of PFS timing was significantly associated with PFS adherence (P<0.001). Moderate awareness was present in 32.0% (117/365) of women who had nonspecific responses that covered the correct time period. Poor awareness in the remaining 16.2% (59/365) of women encompassed time periods that did not include all of the recommended peri conceptual timing of supplementation (Table 3). Table 3 Awareness of peri conceptual timing amongst women who have heard of folic acid. Recommended dose of PFS was known by only 9.3% (34/365) of women, whilst 12.3% (45/365) gave an incorrect dose and 78.4% (286/365) did not know the recommended dose. Women were prompted to identify which food groups are good sources of folate. The most frequently identified food groups were vegetables (90.7%), fruit (71.5%), cereals (65.5%) and beans/pulses/legumes/nuts (64.7%). The food group though lowest in folate was alcohol (97.5%) and most respondents were unsure about offal (47.4%) as a source of folate. Nearly 60% 218/365) of women who had heard of folate were aware of food fortification. The most commonly identified fortified foods were cereals 57.8% (126/218) and bread 41.3% (90/218). Socio-demographic factors significantly related to lower FA awareness on univariate analysis were age <25years (OR 2.46, 95%CI 1.54-3.91, P<0.001), neither married nor de facto (OR 3.18, 95%CI 1.60-6.31, P=0.001), lower education level (≤Grade 10 OR 3.41, 95%CI 1.68-6.93, P=0.001 and lack of private health insurance (OR 2.94, 95%CI 1.37-4.40, P=0.001). In the adjusted model only age <25years (ORadj 2.06, 95%CI 1.20-3.52, P=0.009) and lack of private health insurance (ORadj 2.36, 95%CI 1.13-4.94, P=0.023) remained significant. Health characteristics that were significantly related to lower FA awareness were unplanned pregnancy (OR 2.28, 95%CI 1.31-3.96, P=0.004) and not actively avoiding pregnancy (OR 2.01, 95%CI 1.25-3.22, P=0.004) and pregnancy confirmed at a late gestation (5-8weeks OR 1.91, 95%CI 1.20-3.04, P=0.006; ≥9 weeks OR 4.08, 95%CI 1.28-12.99, P=0.017). This study has shown that nine out of ten women had heard of folic acid, which is amongst the highest reported worldwide8. However, having simply heard of FA was not sufficient knowledge; only one in three women were aware that folate or FA is a vitamin, with over half of the women citing an incorrect answer or that they were unsure of what substance FA was. In addition two in every three women had only a moderate or poor level of understanding of the importance and timing of FA recommendations indicating awareness of the peri conceptual use is also still inadequate. This is analogous to the two Australian studies14,16 which showed that despite a high level of awareness of the importance of FA, far fewer women (1 in 3) knew the correct peri-conceptual timing. Socio-demographic characteristics in this study that predict lack of FA awareness were age <25years and lack of private health insurance. Both of these associations have previously been reported in Australian14,17 and internationally.13,18,19 Like us one of these20 noted that although overall 77.6% of women surveyed were aware of the benefits of taking FA before pregnancy, this was 32.3% in the15-19 years age group compared to 87% of those aged 30-34 and 93% in the 45-49 years age groups. Sadler TW. Embryology of neural tube development. Am J Med Genet C Semin Med Genet. 2005;135C(1):2−8. Detrait ER, George TM, Etchevers HC, et al. Human neural tube defects: developmental biology, epidemiology, and genetics. Neurotoxicol Teratol. 2005;27(3):515−524. Lumley J, Watson L, Watson M, et al. Periconceptional supplementation with folate and/or multivitamins for preventing neural tube defects. Cochrane Database Syst Rev. 2001(3):CD001056. Goldberg BB, Alvarado S, Chavez C, et al. Prevalence of Periconceptional Folic Acid Use and Perceived Barriers to the Postgestation Continuance of Supplemental Folic Acid: Survey Results from a Teratogen Information Service. Birth Defects Res A Clin Mol Teratol. 2006;76(3):193–199. Miller EC, Liu N, Wen SW, et al. Why do Canadian women fail to achieve optimal pre-conceptional folic acid supplementation? An observational study. J Obstet Gynaecol Can. 2011;33(11):1116−1123. Abeywardana S, Bower C, Halliday J, et al. Prevalence of neural tube defects in Australia prior to mandatory fortification of bread-making flour with folic acid. Aust N Z J Public Health. 2010;34(4):351−355. de Walle HE, de Jong-van den Berg LT. Ten years after the Dutch public health campaign on folic acid: the continuing challenge. Eur J Clin Pharmacol. 2008;64(5):539−543. CSIRO Health Sciences and Nutrition. E valuating the Folate - Neural Tube Defect Health Claim Pilot. Process Evaluation of the Management Framework. Outcome Evaluation. Part 4 - Appendices, Appendix 4 Consumers' Knowledge about Folate: A report for ANZFA outlining preliminary results from the CSIRO 1998-99 National Dietary Surveys. 2000. Carmichael SL, Shaw GM, Yang W, et al. Correlates of intake of folic acid-containing supplements among pregnant women. Am J Obstet Gynecol. 2006;194(1):203−210. de Jong-Van den Berg LT, Hernandez-Diaz S, Werler MM, Louik C, et al. Trends and predictors of folic acid awareness and periconceptional use in pregnant women. Am J Obstet Gynecol. 2005;192(1):121−128. Queensland Health. Hospital Activity: Ipswich Hospital, Quarterly hospital activity information for January, February, March 2017. The State of Queensland; 2017. IBM Corporation. IBM SPSS [Computer Program]. 19.0 ed. Somers, New York: IBM Corporation; 2011. Matsuo T. Nutrition education on folic acid in college students. Vitamin Japan. 2009;83:277–286. Chan AC, van Essen P, Scott H, et al. Folate awareness and the prevalence of neural tube defects in South Australia, 1966-2007. Med J Aust. 2008;189(10):566−569. Green-Raleigh K, Carter H, Mulinare J, et al. Trends in folic Acid awareness and behavior in the United States: the Gallup Organization for the March of Dimes Foundation surveys, 1995–2005. Matern Child Health J. 2006 Sep;10(5 Suppl):S177–S182. Oddy WH, Miller M, Payne JM, et al. Awareness and consumption of folate-fortified foods by women of childbearing age in Western Australia. Public Health Nutr. 2007;10(10):989−995. Centres for Disease Control and Prevention (CDC). Use of supplements containing folic acid among women of childbearing age--United States, 2007. MMWR Morb Mortal Wkly Rep. 2008;57(1):5−8. Sharp GF, Naylor LA, Cai J, et al. Assessing awareness, knowledge and use of folic acid in Kansas women between the ages of 18 and 44 years. Matern Child Health J. 2009;13(6):814−821. Marsack CR, Alsop CL, Kurinczuk JJ, et al. Pre-pregnancy counselling for the primary prevention of birth defects: rubella vaccination and folate intake. Med J Aust. 1995;162(8):403−406. Nelson CR, Leon JA, Evans J. The relationship between awareness and supplementation: Which Canadian women know about folic acid and how does that translate into use? Can J Public Health. 2014;105(1):e40−e46. Kondo A, Morota N, Date H, et al. Awareness of folic acid use increases its consumption, and reduces the risk of spina biﬁda. Br J Nutr. 2015;114(1):84–90. ©2018 Mahomed et al. This is an open access article distributed under the terms of the Creative Commons Attribution License , which permits unrestricted use, distribution, and build upon your work non-commercially.